This article first appeared (in this form) in Dutch Birding volume 25 (2003) no. 4. For more information about this magazine see dutchbirding.nl. Western Jackdaw Corvus monedula is a common species in many parts of Europe, including the Netherlands. 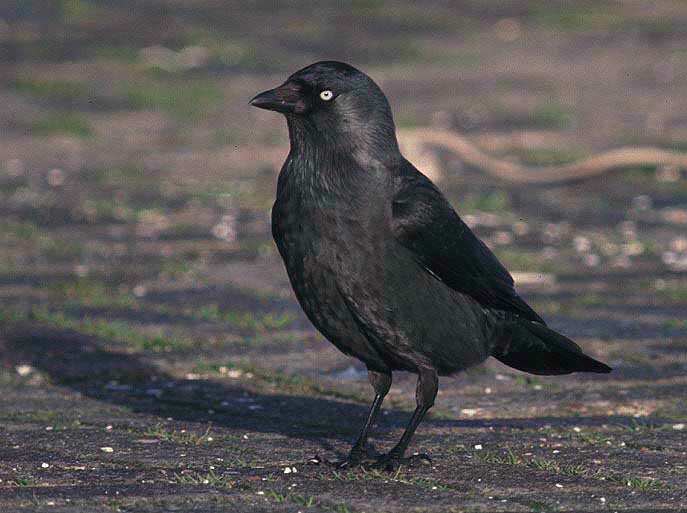 In winter, Nordic (or Scandinavian) Jackdaw C m monedula (hereafter monedula) and Russianringii) occur in the Netherlands, in addition to the widespread breeding (and resident) Common Jackdaw C m spermologus (hereafter spermologus). 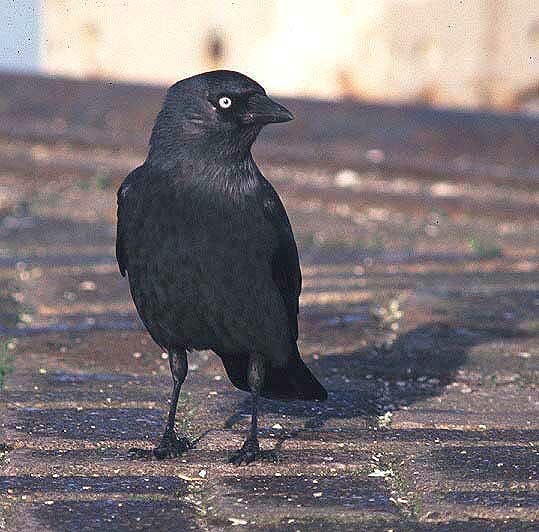 The purpose of this article is to provide insight in the field identification of the two eastern subspecies of Western Jackdaw and their occurrence in the Netherlands. In most field guides and handbooks, these subspecies are briefly mentioned at best and the information given with regard to field identification and distribution is often open to interpretation. This article is mainly based on personal observations of jackdaws at Wijster, Drenthe, the Netherlands, during six consecutive winters (1996-2002), on studying literature and on a visit to the specimen collection of the Zoölogisch Museum at Amsterdam (ZMA), the Netherlands. The first results of this study were published (in Dutch) in Offereins (1999) and two photographs taken at Wijster were published in Harrop (2000). This article only deals with the eastern subspecies, therefore not discussing Algerian Jackdaw C m cirtensis, which is a most unlikely vagrant to western Europe. 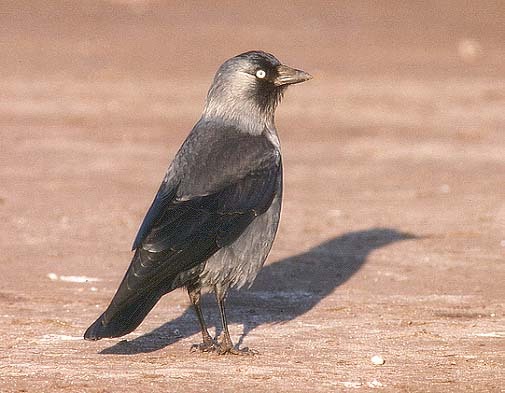 Western Jackdaw is represented in Europe by three different subspecies in Europe: spermologus, monedula and soemmerringii. Voous (1950) and Voipio (1969) consider nominate monedula to be the westernmost representative of the westerly expansion of the soemmerringii-branch. In short, this would mean that nominate monedula is basically the link between the two best most easily separable subspecies, being namely soemmerringii and spermologus. Monedula breeds in south-eastern Norway, southern Sweden and northern and eastern Denmark (Cramp & Perrins 1994). In the past, jackdaws occurring in central Europe between c 10° en c 23° E, south to Austria and Croatia, were sometimes separated as 'turrium' (eg, Voous 1950). This form was included in spermologus by some but is nowadays considered to belong to monedula (Cramp & Perrins 1994). This means that the transition zone between spermologus and monedula in Europe covers a broad area from Denmark and the western borders of Germany to Switzerland and that birds breeding in Germany close to the Dutch border may already show some characteristics of monedula. Mixed breeding of spermologus and monedula has been reported on several occasions in the Netherlands. For instance, a mixed pair was photographed at Boksum, Friesland, in spring 1999 (Hemrika 2001). This limits the actual range of true spermologus to the western half of the Netherlands and Belgium, Britain, France, the Iberian peninsula and Italy. Spanish birds, which are slightly paler in worn plumage, are sometimes recognised as a different subspecies, 'ibericus', but are generally included in spermologus (cf Harrop 2000, Cramp & Perrins 1994). Italian birds are also rather pale and can even show a pale crescent, recalling monedula, but are at present 'provisionally' included in spermologus' (Cramp & Perrins 1994). In southern Finland, monedula gradually intergrades into soemmerringii from west to east (Voipio 1969). This transition zone runs from north to south across the Baltic States, through eastern Poland to Romania and Croatia (Cramp & Perrins 1994). The actual range of soemmerringii is huge and covers the former Soviet Union east to Lake Baikal, Siberia, and north-western Mongolia, south to Turkey, and Israel and the Himalayas (Voous 1960, Cramp & Perrins 1994, Madge & Burn 1994). Included in soemmerringii are birds from the Balkans and Greece (sometimes recognised as a separate subspecies, 'collaris'), from, birds Cyprus, Turkey, Levant, northern Iraq and Iran and Turkmeniya (sometimes recognised as 'pontocaspicus') and from central Siberia and Mongolia (sometimes recognized as 'ultracollaris') (cf Cramp & Perrins 1994). Probable monedula's. Left: Lauwersoog, the Netherlands, 7 November 2000. Under: Lauwersoog, 29 November 2000. Both birds are rather dark an uniformly coloured with faint silvery collars. Such birds could very well originate from the intergration zone between Common Jackdaws spermologus and monedula, sometimes referred to as 'turrium'. Western Jackdaw is mostly resident. The northern populations are more migratory whilst soemmerringii is a true migrant. First-year birds are more migratory and will wander over longer distances. During migration, birds are often found in the company of Rooks C frugilegus (Voous 1960, Cramp & Perrins 1994). Because of the westerly to south-westerly migration in autumn (Cramp & Perrins 1994), both monedula and soemmerringii appear in north-western Europe. Monedula that leaving the breeding grounds in autumn, mainly winter mainly in north northern Denmark, the Low Countries and north-western France. Birds from Finland (monedula/soemmerringii) winter in northern Denmark and the Netherlands (Glutz von Blotzheim & Bauer 1993). The first nominate monedula appear in the Netherlands in October, with a peak by the end of October (Bijlsma et al 2001). It seems likely that soemmerringii arrive later. By the end of February, the first nominate monedula/ and soemmerringii leave the Netherlands with a migration peak in late March (Bijlsma et al 2001, LWVT/SOVON 2002). Soemmerringii winters from the breeding grounds in an area extending from the breeding grounds across southern Sweden to central Europe north of the Alps. There are also ringing recoveries from Belgium and north-eastern France (Glutz von Blotzheim & Bauer 1991). The occurrence of soemmerringii in France has been well studied in recent years; results indicating that more than 100 soemmerringii may winter annually in north-eastern France were published by Crouzier (1995) and Crouzier et al (1999). Examination of literature and skins indicate that, up to 1995, there were 11 recoveries of birds ringed in Finland, Lithuania and Poland in France. In Britain, monedula is considered a regular winter visitor. Despite several reports of birds showing characters of soemmerringii, there are up to now no definite undisputed records in Britain (Harrop 2000). 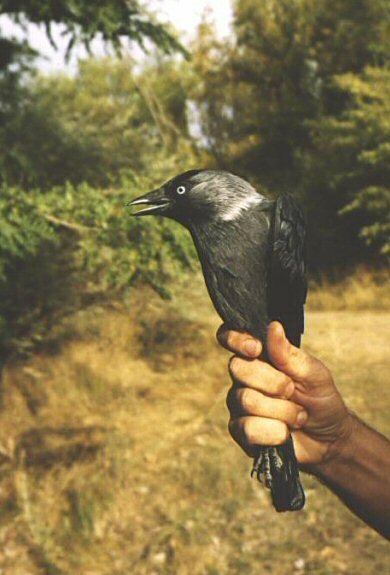 The Record Committee of the British Ornithologists' Union (BOURC) stated '...that plumage characters of Jackdaws are so variable that the committee considers that this taxon can be accepted as new to Britain only if a breeding bird or pullus ringed within its normal breeding range is recovered and shows the characters of the race' (Marr et al 1998). The occurrence of both eastern subspecies in the Netherlands is further discussed below. When identifying the subspecies, it is important to judge posture and light correctly. 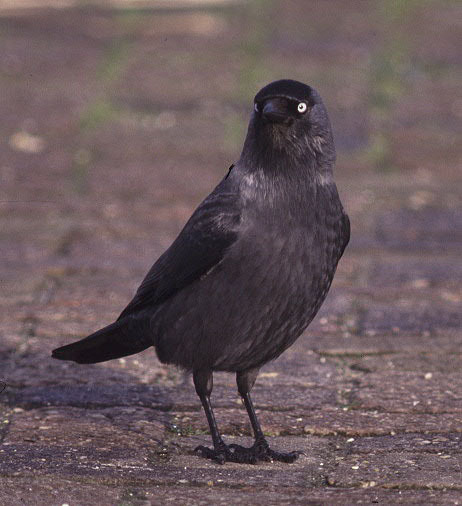 A jackdaw of either eastern subspecies can, when facing the observer, show a much whiter neck-patch than when observed sideways. In bright sunlight, the neck-patch can appear much paler than it actually is. Cloudy weather offers the best conditions for observing and interpreting the characters. All details in the following text refer to adult birds in fresh winter plumage unless stated otherwise. 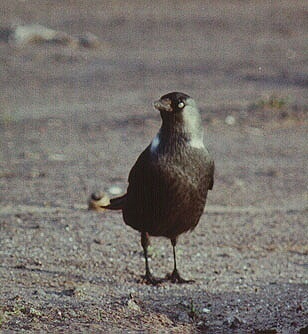 In the literature, the term (half-)collar or crescent is often used for both the patch on the lower neck and the collar running from the lower neck almost to the nape but in this article they are used as separate terms (cf Voipio 1969), because jackdaws with a bright neck-patch but without a collar can occur. Adults of all three subspecies have a complete post-breeding moult from mid May to mid October (Cramp & Perrins 1994), which means that adult birds in winter are in fresh plumage. By March, this plumage becomes worn, which can result in a paler collar and darker underparts. In both eastern subspecies, the collar may be absent in the breeding season (Cramp & Perrins 1994, Svensson 1992). Adult winter spermologus has no pale collar or spot in the lower neck and shows a darker nape, ear-coverts and underparts than monedula. These birds show almost no contrast between the scapulars and the wingfeathers, unlike monedula and western populations of soemmerringii. Most spermologus show almost no contrast between nape, throat and underparts, resulting in a rather uniform plumage. Note that the eastern populations of spermologus show, on average, a paler mantle and underparts, recalling monedula, whilst the darkest individuals of spermologus in this respect occur in the populations from Britain, north-western France and Morocco. My observations on breeding jackdaws around Assen, Drenthe, led to the conclusion that most - if not all - birds show dark-grey to grey underparts, mantle and scapulars (the latter contrasting with the dark wings) reminiscent of monedula. As a result of wear, spermologus may show a narrow pale line in the lower neck and some pale fringes to the mantle and underparts in early spring, both recalling monedula. Adult spermologus. Lauwersoog, the Netherlands 29 November 2001 (above and below). Note on both pictures the overall dark impression with no contrast between the ear-coverts and nape and the underparts. Some spermologus may show paler earcoverts and nape but never a paler collar as in monedula. Compared with adult spermologus, monedula has a paler nape and ear-coverts, which at most can be slightly brighter than a spermologus in breeding plumage. On most adult monedula, the underparts are slightly darker than the nape and ear-coverts but this can also be shown (albeit in darker tones) by some spermologus. The main difference with spermologus is that the underparts are plumbeous-grey and paler than in spermologus, of which the underparts are more grey-black. The dark throat of monedula contrasts much more with the underparts than in spermologus. Note, however, that some monedula only show a dark chin and a paler grey throat, sometimes of the same tinge as the underparts. In direct comparison with spermologus, the paler underparts of monedula are a very useful field mark. Adult monedula, Wijster, the Netherlands, 11 January 2003. Typical bird with silvery collar and plumbeous-grey underparts, mantle and scapulars, the latter contrasting with the dark wings. Ear-coverts and nape are paler than in adult spermologus. The 'scaly' mottling to the underparts and mantle aren't this obvious in every monedula. Monedula often shows pale feather fringes to the mantle feathers and underparts and vague dark mottling to the belly and flanks. The pale fringes are, however, rather variable and can also be shown by eastern populations of spermologus, especially, because of wear, in spring. The fringes are most marked in bright sunlight. The mottling to the underparts can also be shown by spermologus but is far more obscured because of their darker underparts. It is unclear if, or to what extent, western populations of soemmerringii show these markings. Adult monedula. Barneveld, the Netherlands, 21 December 2003. Picture by Rik Winters. Typical individual. Note especially the faint dark mottling to the underparts. The most striking characters of monedula are the highly variable patch on the lower neck and the silvery (half-)collar. The neck-patch is variable in both size and tinge. The latter It varies from a vague greyish spot on the lower neck to one that is almost pure white. It continues as a broad silvery and often more diffuse collar, sometimes running extending almost to the nape. Some individuals can show an almost white neckpatch neck-patch and no collar at all, whilst in most birds neckpatch neck-patch and collar form a narrow silvery whole. The appearance of the collar depends on the posture of the bird. It is most broad when the bird stretches itself and most narrow - often just a pale line - in a more relaxed posture. The collar can appear almost white in bright sunlight but is never as sharply defined as in soemmerringii (see text below). Two adult monedula's. Wijster, the Netherlands, 17 January 2003. Note the difference in shape and intensity of the collar and the similarity in the tone of the underparts with the faint mottling. Adult monedula. Wijster, the Netherlands, 17 January 2003. Although this bird shows no collar, the plumbeous-grey underparts and scapulars with the faint dark mottling clearly point to monedula. A well-marked adult soemmerringii should not be too difficult to identify. The nape and ear-coverts are clearly paler than in adult-winter spermologus and also paler than monedula, although there is some overlap with the latter. The nape and ear-coverts of soemmerringii, however, have a more intense coloration, with a vague purple tinge, resulting in more contrasting black crown and throat than in monedula, although this may be hard to assess on a solitary bird. The underparts and mantle are toned blackish-grey of a tinge between spermologus and monedula, becoming darker towards the east and south of its range (Cramp & Perrins 1994). The collar is always clearly white and sharply defined over its full length, forming a whole with the neck-patch. All this results in a very contrasting bird. When viewed from behind, the collar can appear as a broken white line. In the most extreme monedula, only two diffuse grey spots are visible. The collar of soemmerringii is c 0.5 cm wide on the lower neck and 4-5 cm long (Cramp & Perrins 1994) but it is unclear if this applies to all populations. Adult soemmerringii. Veendam, the Netherlands, 3 February 1988. Picture by Emo Klunder. Two pictures of the same bird. A very contrasting bird with a long, broad and white collar, very pale nape and ear coverts and almost black underparts. These features make it very likely that this is an eastern soemmerringii, probably a rare vagrant to the Netherlands. Compare this to the picture below from Kazakhstan. Adult soemmerringii. Kazakhstan, September 2003. Picture by Justin Jansen. The three subspecies of Western Jackdaw discussed here cannot be separated on measurements, which is quite remarkable for a species with such an extensive breeding range. Only the bill of spermologus is slightly heavier and the middle toe slightly longer than in the other subspecies (Cramp & Perrins 1994). During his study on Dutch skins of skins of soemmerringii in Dutch museums soemmerringii, Voous (1960) noted a difference in gloss on the crown, which was purple-blue on monedula and spermologus and ink-black on soemmerringii. While studying the same collection at the ZMA, I found that this difference very hard to determine. It was only apparent in direct comparison with spermologus. I also studied this the gloss of the crown on skins of soemmerringii, collected on their breeding grounds. Remarkably, I noticed this purple-blue gloss on every first-year soemmerringii at the ZMA and but not on every adult. Voous (1960) also found an obvious sandy tone to the underparts of monedula. While observing many 100s of monedula in the field, I never saw this tone on any bird but at the ZMA every monedula showed it. One may wonder if this collection, put together in the first half of the 20th century, has not undergone some kind of colour change. Research by J F de Miranda on the same collection resulted in the following findings: in soemmerringii, the black crown-patch was more square and shorter than in the other subspecies, whilst the crown-patch in monedula was more oval and of virtually of the same size as in spermologus (Gerald Oreel in litt). These additional characters are, however, of little or no use in the field. Although authors have recommended not to identify first-winter Western Jackdaws to subspecies (Cramp & Perrins 1994), a few remarks can be made. First-winter birds can generally be identified by the brownish-tinged iris and juvenile dull-brown primaries, secondaries and tail whereas adult birds have shiny black feathers (Voous 1960, Cramp & Perrins 1994). The field marks to identify the various subspecies in first-winter plumage are more subtle. Monedula can be told from the almost uniform grey-black spermologus by its paler grey underparts. The nape and ear-coverts tinge resembles that of adult-winter spermologus and is therefore paler than in first winter first-winter spermologus, resulting in a more contrasting crown and throat. Sometimes, a faint collar or neck-patch is visible (Voous 1960). First-winter soemmerringii skins studied at the ZMA showed a pale nape and ear-coverts, similar to those of adults. The tone of the underparts lies between monedula and spermologus. None of these birds showed a paler collar. On birds studied in eastern Finland (Voipio 1969), considered to be soemmerringii, 43% of the first-winter birds showed a faint white collar and just two birds first-winters had a white collar as in adults (n=46). Two monedula's. Wijster, the Netherlands, 16 December 2001. The bird on the right is a classic individual. Bird on the left is a juvenile because of the brown tinge in the wing feathers and hardly visible brown iris. This bird shows a faint collar and is therefore probably monedula. A study on the variation in the hybridisation zone of overlap between monedula and soemmerringii was undertaken in southern Finland by Voipio (1969). The variation in soemmerringii was also described by Voous (1960) but on birds of unknown origin collected in the Netherlands. Voipio (1969) observed a gently sloping cline of increasing colour-saturation of the whole plumage - becoming darker - from north to south or southwest in northern parts of Europe. Being a more distinctive variation, he considered the white patch in the foreneck and the silvery collar to be the main basis for intraspecific taxonomy in the species. He concluded that almost the entire Finnish population is intermediate between soemmerringii and monedula, with pure soemmerringii being restricted to the far east. He also concluded that even the westernmost Finnish populations are not pure monedula because of the highly variable collar and the existence of an intermediate population near Uppsala, Sweden. This means that the zone of overlap between soemmerringii and monedula in north-eastern Scandinavia is at least 270 km wide. During a study by Voous (1960) on jackdaws in the area of the rivers Boeg and Njemen in eastern Poland, where monedula en and soemmerringii meet (Voous 1950), highly variable breeding populations were found. 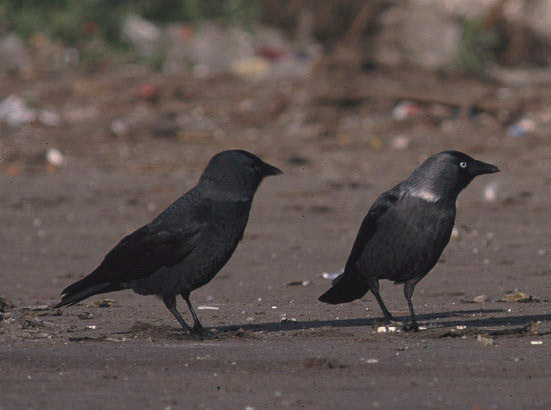 These populations included birds with variable or absent collars (16%), dark nape and ear-coverts (16%) and dark underparts (8%), not different from the Dutch population of spermologus. Being clinal, the variation in the collar in monedula and soemmerringii is enormous. A distinctive trend in Scandinavia is that the silvery collar in monedula gradually darkens towards the west and south-west and the average size as well as the frequency of occurrence of the white neckpatch neck-patch gradually decreases until this characteristic entirely disappears in spermologus (Voipio 1969). The same trend is also noticeable from eastern Europe towards the west (Glutz von Blotzheim & Bauer 1991). Furthermore, there are individuals possessing no patch or collar or just a vague one. This is more often the case in monedula than in soemmerringii, and these are relatively often females (Voous 1960, Voipio 1969). In southern Finland, the average size of the white patch in the foreneck increases from south-west to north-east and, especially, east. The average mean size of this patch in the easternmost Finnish population is more than twice that of the westernmost population, whereas the whiteness of the collar increases from west to east. But as said earlier, in females the collar is not as white as in males. In the easternmost population, 'collarless' individuals among adults were virtually absent (Voipio 1969). The underparts and upperparts of monedula can also be variable. Most birds show blackish-grey to grey underparts and mantle, generally becoming darker towards the western borders parts of their range. Some monedula, however, can show evenly pale grey underparts, nape and ear-coverts, mantle and scapulars with contrasting black wings and crown, somewhat reminiscent of a miniature Hooded Crows C cornix. In these types of birds, the lack of a dark throat is very obvious. The geographical origin of these birds is, however, unclear. They may even be come from within the range of soemmerringii. In the Netherlands, such birds usually show up from December onwards, about two months later than most monedula. Above and under: probable monedula. Wijster, the Netherlands, 16 December 2001. They stand out because of their uniform pale-grey head, underparts and back, reminiscent of miniature Hodded Crows C. cornix. Intriguingly, the show merely a black chin instead of a dark throat. Because of this their black forehead and wings really stand out. The (half)collar in the lower neck is usually silvery grey (more whitish in the foreneck) and rather broad. The geographical origin of these Jackdaws is, however, unclear. These birds tend to show up in the eastern parts of the Netherlands from mid-December onwards, some two month later than most Nordic Jackdaws. The variation within both western and (south-)eastern populations of soemmerringii is not fully understood. It is also unclear where both populations meet. The eastern and south-eastern populations have dark underparts (with variable pale fringes in worn plumage), mantle and scapulars as in spermologus and often quite broad and long white collars (cf Cramp & Perrins 1994). The western populations, however, seem less marked in this respect, with more dark-grey underparts resembling most monedula. The shape and whiteness of the collar seems to be less varied than in monedula but especially females and first-winter birds can strongly recall monedula, in showing no collars or just a vague one (Voipio 1969, Geert Groot Koerkamp in litt). If the aforementioned characters are used to define the status of the two eastern subspecies in the Netherlands, it seems clear that it is different from their status as mentioned in literature (eg, SOVON 1987, van Dijk & van Os 1982). From experience in the field, I conclude that monedula is a common winter visitor on the higher grounds in the eastern and southern parts of the Netherlands and that very occasionally they are accompanied by a small numbers of soemmerringii. This conclusion is shared by more recent literature, in which monedula is called a common winter visitor and soemmerringii a regular but scarce winter visitor in the southern and eastern parts of the Netherlands (Cramp & Perrins 1994, van den Berg & Bosman 2001). It must be stressed, however, that, as since many wintering jackdaws are first-year birds, many monedula and especially the more migratory soemmerringii may be overlooked. The same goes for adults individuals without a pale collar. Only the obvious individuals with bright collars are likely to be noticed. Soemmerringii might well be less scarce in winter than is currently assumed. On the other hand, increased interest in this subspecies in recent years has not led to a noticeable increase in reported sightings. Although low in numbers, the occurrence of monedula in the Netherlands is substantiated by in ringing recoveries, with 13 recoveries of birds from southern Scandinavia and two from south-western Finland. The occurrence of soemmerringii in the Netherlands, on the other hand, has not yet been proven by ringing recoveries (van Dijk & van Os 1982, Speek & Speek 1984). The occurrence of both eastern subspecies in the Netherlands seems largely restricted to the higher (sand)grounds of the east and south. In the lower parts, spermologus is much more numerous (cf Bijlsma et al 200, Jukema & Rijpma 1997). Groups of jackdaws can be encountered, often in the company of Rooks, on intensively used grassland or arable land. Large groups of jackdaws can be seen on rubbish-tips, such as the VAM near Wijster in the north-east of the Netherlands where flocks of up to 2000 have been seen in mid-winter. At least 70% of the birds here are monedula (based on their neck-patches and collars) but it must be stressed that many are first-year birds which are hard to identify to subspecies. During observations in the winters between 1999 and 2002, I only observed two or three soemmerringii based on the aforementioned characters. On the grass and arable lands just outside the VAM, smaller groups (up to 750) can be encountered. In these groups, adult birds form a majority. They consist for about 90% to sometimes even 100% of monedula with rarely a pure soemmerringii. 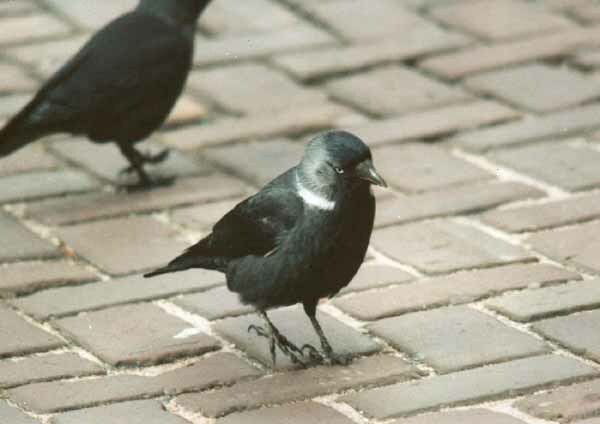 In cold winters, numbers of Jackdaws can even be higher because on 13 February 2003, after a prolonged cold spell, The Bakker (pers comm) observed c 5000 birds, of which c 30 showed the characters of soemmerringii. So far, my highest count of the latter at Wijster has been 34 in a group of 530 mostly monedula on 1 February 1998. Around Assen, Drenthe, c 25 km to the north and outside the influence of the VAM rubbish tip, the percentage of monedula in the larger groups is seldom higher than 20%. A slightly lower percentage (14.9%) was also reached during a survey on 'collared' jackdaws in Noord-Brabant, the Netherlands (cf Glutz von Blotzheim & Bauer 1991) although presumably the assumption that these were all soemmerringii was erroneous. It seems that of the three subspecies, spermologus and the eastern and south-eastern populations of soemmerringii are most easy to identify. 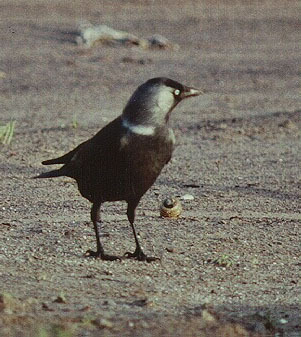 Voipio (1969) concluded that because of the overall darker plumage and the lack of a pale neck-patch and collar in spermologus, the differences between this subspecies and monedula is stronger than that between monedula and the western populations of soemmerringii. Voipio (1969) also considered the white neckpatch neck-patch and collar to be the main basis for separation between monedula and western populations of soemmerringii. However, in the latter these can be lacking in females and in first-winter plumage and obscured because of wear in breeding plumage. This leaves only adult males in fresh plumage identifiable by their neck-patch and collar since all other field marks show overlap with monedula. Given these findings, it might be considered to place at least the western populations of soemmerringii with monedula and restrict soemmerringii to the dark-bodied populations also previously named as 'collaris', 'pontocaspicus' and 'ultracollaris'. A positive result of such a decision would be that many 'eastern jackdaws' can could be quite easily identified distinguished from spermologus by their pale or white neck-patch and collar and the tone of their underparts combined with the vague mottling, and that 'true' soemmerringii would become a real vagrant in western Europe for which acceptable records need thorough documentation. This said, it is obvious that more study is needed to establish the actual range and geographical variation of the various populations of soemmerringii, of which even the easternmost could reach western Europe since it is the most migratory. I thank the following persons for their various contributions to this article: Arne Ader, Theo Bakker, Enno Ebels, Jonas Grahn, Martin Helin, Emo Klunder, Geert Groot Koerkamp, Hannu Koskinnen, Teus Luijendijk, Gerald Oreel, Ale Terpstra, Jorma Tenovuo and Rik Winters. Special thanks go to Kees Roselaar for his guidance at the ZMA and for his comments on the first draft of this article and to Jan Allex de Roos for critically checking my initial translation. van den Berg, A B & Bosman, C A W. 2001. Zeldzame vogels van Nederland - Rare birds of the Netherlands. Avifauna van Nederland 1. Tweede editie. Haarlem. Bijlsma, R G, Hustings, F & Camphuysen, C J 2001. Algemene en schaarse vogels van Nederland. Avifauna van Nederland 2. Haarlem . Crouzier, P & CHN 1995. Observations françaises du Choucas des tours 'oriental' Corvus monedula soemmerringii: une enquête du Comité d'Homologation National. Ornithos 2: 168-169. Crouzier, P, Duquet, M, Noël, F & CHN 1999. Le Choucas des tours Corvus monedula de la subspecies orientale soemmerringii en France: le point après 3 ans d'enquête. Ornithos 6: 178-182. Glutz von Blotzheim, U N & Bauer, K M 1993. Handbuch der Vögel Mitteleuropas 13/III. Wiesbaden. Harrop, A 2000. Identification of Jackdaw forms in northwestern Europe. Birding World 13: 290-295. Jukema, J & Rijpma, U 1997. Populatiesamenstelling van overwinterende Kauwen Corvus monedula in Noord-Friesland. Limosa 70: 61-66. LWVT/SOVON 2002. Vogeltrek over Nederland 1976-1993. Haarlem. Speek, B J & Speek, G 1984. Thieme's vogeltrekatlas. Zutphen. Voipio, P 1969. Geographical variation in Corvus monedula in Finland. Ardea 57: 48-63.